With its modern, centrally located building, designed by two renowned architects, our partner school has a clear goal: providing high quality English courses in a modern and stimulating environment. Under the guidance of qualified and motivated teachers, you'll make rapid progress with the help of the latest technology. The school has 18 bright classrooms spread over 4 floors, all fitted with interactive whiteboards, as well as a comfortable lounge cafeteria with Wi-Fi and a spacious lobby on the ground floor. The large student area located on the same floor is equipped with a flat-screen TV, computers and vending machines for snacks and drinks: it's the perfect place to socialise with the other international students! Located in the centre of Dublin, the school is well served by public transport, so the city's many attractions are all within easy walking distance. Air conditioning, library, relaxation area, interactive whiteboards, self-access computers, high speed Wi-Fi internet, cafeteria, wheelchair mobility access. During the high season (July-August) 30+ students can study with other students of the same age group. This applies to students booking General or Intensive courses. Vibrant,fun-spirited Dublin is a great setting for a gap programme. Pick up the Irish lilt in your English accent as you experience everyday life in total immersion. If you’re thinking about a future career, a General English + Business course is a fantastic option. You’ll improve your English as well as learn specific vocabulary for business and skills like giving presentations, writing reports and practising interactions with potential clients and coworkers. You’ll be amazed at the results! Students may need a new textbook if they change levels or the syllabus changes. A new book costs €30 (IELTS: 35 €), or it can be rented, which requires a €20 deposit that will be returned if the book is kept in good condition. École vraiment intéressante et bon emplacement au centre ville. Manquerait un petit réfectoire/cafétéria. Manque pour (le niveau B2) de faire plus d expression orale et écoute que de la grammaire. Reste "très scolaire". Sinon, tres bonne ambiance et approche de la langue ! Super enseignement. Je recommande vivement Mme Large. Sa générosité et sa cuisine permettent un bien être à Dublin et de pratiquer l anglais sans problème ! Je trouve que les cours proposés ne sont pas vraiment exploités. J en ai fais plusieurs, cours de grammaire ou cours de vocabulaire et nous n'avons même pas abordé de sujets ! Manque un niveau propose lors de ces cours (car tout niveau est accepté donc nous faisons de la grammaire du niveau A1par exemple...). Malgré une mésaventure avec l école quand a mon logement, le personne est très serviable et à l écoute. La scuola è ben organizzata. Mi sono sentita protetta e al sicuro ovvero per qualsiasi problema o chiarimento, nonostante non conoscessi bene la lingua, sapevo su chi contare. I miei insegnanti erano molto bravi in particolare Larry, un insegnante molto professionale e disponibile. Se si viaggia in macchina ed escludendo il traffico, l'abitazione è lontana dalla scuola circa 20-25 minuti. Con il bus, invece, il tempo necessario è di oltre 60 minuti (traffico permettendo).Per quanto riguarda la Sig.ra Paula, Lei è una splendida persona, gentile, disponibile e sempre attenta ai miei bisogni. E' una bravissima cuoca. La sera durante la cena e non solo, facevamo molta conversazione. La domenica, quando io ero disponibile, andavamo in chiesa assieme. Mi ha fatto sentire parte integrante della Sua famiglia. Rimarrà un ricordo indelebile. Kurse sind sehr klein und ermöglichen so ein intensives Erlernen der Sprache. Irish people are said to be very welcoming. Good news: this is not only a rumour, it is actually true! I spent a month in Dublin and stayed with a really cool family. Always available, talking to me, interested in what I was doing – these were great conditions to practise English. The school is located in the centre of Dublin, which makes it easy to explore the town centre. Standard courses were interesting, but perhaps not intensive enough for me. In any case, the school staff were close to students and attentive to their needs, which was much appreciated. And Ireland...well, what a beautiful country! Beautiful excursions to make, beautiful landscapes to explore: this was a real change of scenery for me. I spent 3 months in Dublin, I studied at Dublin Atlantic language. My stay went very well, as well in town as at the school, where the atmosphere was amazing. At the school, everyone is very friendly, the teachers, the students and especially the receptionists. Everyday, various activities are offered by the school, each more interesting and funny than the last. 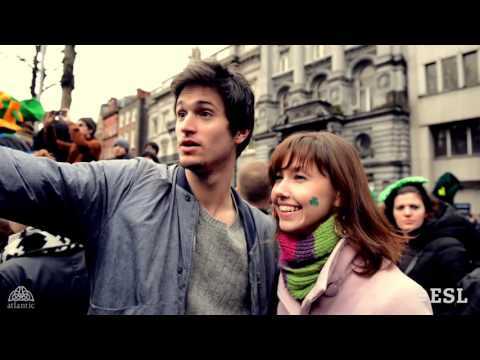 To finish, Dublin is a great town, for its cultural activities as well as for its nightlife. I spent a really good time in Ireland, more specifically in Dublin. The school is brand new and well located; all the classrooms are very well equipped. I loved the fact that I could speak with people from all over the world. We were 11 in my class, so progress was easy. My host family was great and lived only 30 minutes away from the school, by train. I decided to stay in Dublin; I found a job and I will stay longer to keep improving my English. If you're looking an authentic experience, this is the ideal option for you! The Irish host families, welcoming by nature, are carefully selected by our partner school and offer the comforts of a home while giving great insight into Ireland’s rich culture. You'll practise English in everyday situations and strengthen your language skills day after day. Staying in a single room (on request, twin/double rooms for students travelling together), you'll receive breakfast and dinner from Monday to Friday and full board at weekends. Host families are located up to 55 minutes by public transport from the school, although travel times may be slightly longer during peak traffic times. This modern residence is just steps from Dublin’s biggest and best concert venue, 3Arena, in the hip Docklands area. Your room features a small double bed, desk, chair, storage space, free bed linens and towels and your own bathroom! Shared amenities include an open-concept kitchen and living area with a flat-screen TV. Enjoy perks like free Wi-Fi, a cinema room, gaming pods, a gym, courtyard, roof terrace, laundry facilities and 24/7 security. Walk to school along the River Liffey in about 20 minutes or hop on the Luas and be there in 15. This modern-style residence is located in Dublin's hottest new neighbourhood and is the perfect place to call home for your language stay! There is whole host of on-site facilities to enjoy. From a gym and fitness studio, to a cinema and games room, there's something for everyone, including study rooms and beautiful courtyards. Step outside and hop on the Luas line, or take a stroll down the Liffey, and you'll be at Trinity College and the city's other universities and colleges in no time. Students will be asked to sign the "Residence Rules" on the first day at school. Rooms fitted with a small double bed (122cm x 190cm). Cleaning provided only on arrival and departure. Our partner school offers a rich and varied activities programme every week. Sports fans will enjoy country walks in the green surroundings of Dublin or savour a river fishing party. The city itself offers a host of attractions: sign up for a guided walking tour of the city to discover its countless museums, art galleries, trendy shops and cool pubs and flip through the pages of Ireland’s fascinating history! Discoveries of all kinds await you in Dublin’s busy streets and Georgian-style buildings. The school also offers book clubs as well as classes dedicated to Irish songs, culture or language. The local cultural scene is very lively and will unveil its musical, literary and culinary treasures to you. Get ready to have a great time during your language course in Dublin! 857 students rated this school. See the testimonials of former students. For courses of 12 weeks and upwards, ESL offers you the return flight to Dublin. Valid for all enrolments at the Atlantic school in Dublin.